A new grand vicar, known as the usurper, has taken over the keep, and is using its knowledge to reinforce his hold on power. Despite their good intentions, the seekers find themselves leading an army. And for the first time in a millennium, their world experiences the horror of war. But the keepmasters' science is no match for the dreamers, leaving Orah and Nathaniel their cruelest choice - face bloody defeat and the death of their enlightenment, or use the genius of the dreamers to tread the slippery slope back to the darkness. You know how sometimes you put off the last part of a book because it's so good you can't stand for it to end? Well I did that with this one. I sat on the last 30 mins for 3 days before finishing it! Yes, it's that good. Thank you David for being so brilliant & such a wonderful writer. Your use of words to describe things blew me away so many times. Your way of looking at the human spirit was beautiful. I can only say that I will miss the friends I made on this 3 book journey and I will think of these characters for the rest of my life. I will be recommending this series to any & everyone. Orah and Nathaniel are back from their travel in hopes of bringing new and better things but what they find is chaos. They hoped to bring a great light what they instead brought was darkness and war, but what can they do, and how can their new tech help them to avoid the bloodshed? 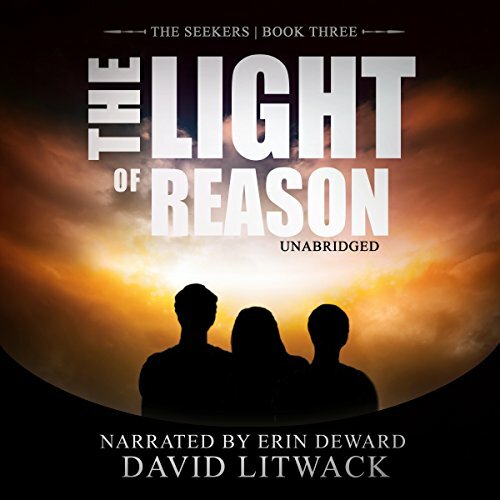 This is a wonderful series it can be fun in so many ways but also deep and make you think, and narrator Erin deWard plays the different parts so well you will find yourself lost in their world. There is a lot of action, and suspense for sure. But three young adults who will lead their world into peace or war, depending on how things work out but are ready for each, as I teen I was ready to go to war but I never had to make the decision to send people to war and I know I could not have made that decision. But in their world they have already seen and endured so much, it is a story not to be missed. Very satisfying conclusion to this complex yet simple story. Really enjoyed this whole series. This book is just as well written, entertaining and enjoyable as the previous installments in the series. The whole series has been creative, original, thought provoking and worth every minute. Balance is needed in every society. The Greenies, The Techies, The Dreamers all learned this the hard way. Orah, Nathaniel and Thomas started out as Children of Darkness in the only world they had ever known. They became the Seekers of the Truth through their journeys to the Keep and across the ocean. After their discoveries, meeting the Greenies, Techies and others they are now the Light of Reason and must help the people of Little Pond regain their freedom from the oppressive Vicars and restore a balance to their world. Orah and Nathaniel travel back across the ocean to Little Pond returning as they said they would. Only to find in their absence things have spiraled further out of control on their side of the world. The Usurper (grand Vicar) has taken control of the "Keep" with the intention to keep it's knowledge for himself and rules with an iron fist. He has lied and told of Orah and Nathaniel's death on the ocean in a bid to regain/retain power over the people. When they reappear his lies are exposed and the real battle begins. Erin deWard did a great job once again with the narration. She is the voice of the series. It makes the story that much more enjoyable when the characters always sound the way you remember. Pleasant voice. Clearly spoken with a nice smooth pace. Really good character voices. She brought the characters and story to life. Very enjoyable. This is a terrific ending to an amazing series!! I loved all three books and this book continues where book 2 left off. The narrator did an amazing job with the characters and bringing them to life. Highly recommend this series!! The author did a great job with this book and bringing the Seekers trilogy to a satisfying conclusion. This book is a unique and original story on its own, but it picks up exactly where book two left off, so you might not understand the full story if you skip the first two. As with the previous stories, the author continues his unique style of dystopian Sci-Fi with authoritarian theocracy, which is something I enjoyed. One of the things I enjoyed about book three is that it’s a great standalone story while also wrapping up the trilogy nicely. All of the characters which I’ve grown attached to throughout the first two novels are back along with a few surprises. The narrator does an amazing job with this story. I really enjoyed how she portrayed the characters emotions, which kept me immersed in the story. Her tone and pacing were good, and she did a fantastic job giving all of the characters distinct voices which seemed to fit the characters well. Overall this was another great listen, and a great trilogy as a whole.